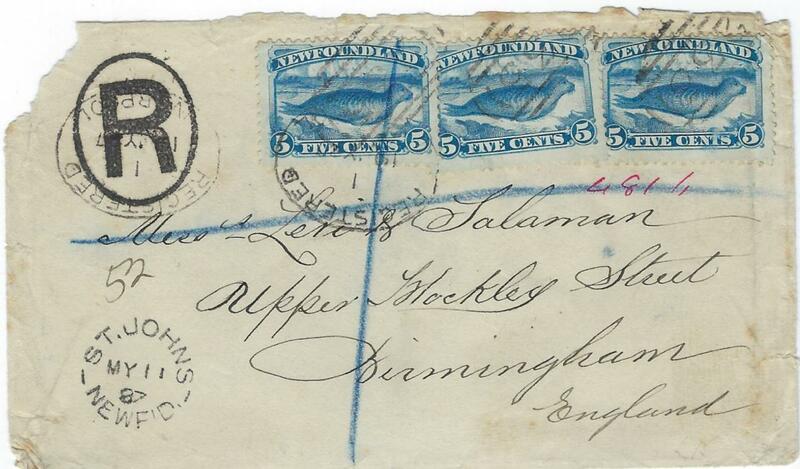 (British Colombia) 1871 (Jan 11) cover to England bearing single franking perf 14 25c. 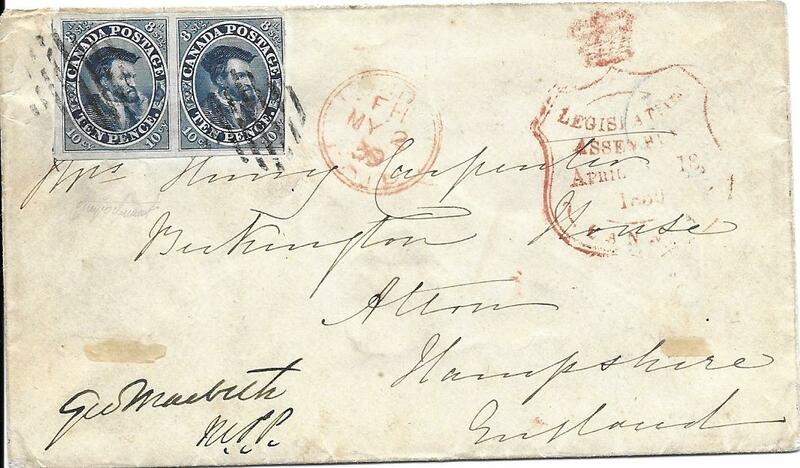 yellow tied by fine �35� numeral, faint cds in association bottom left, Harlow arrival backstamp. 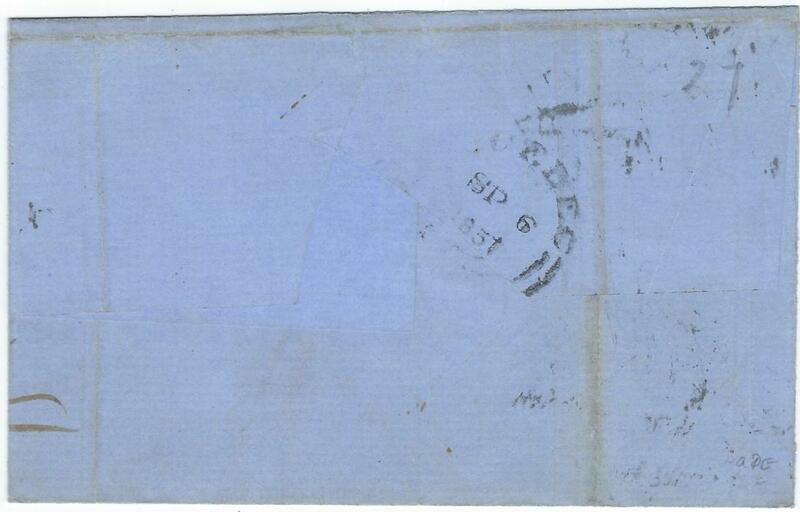 The stamp has been roughly removed from sheet at base, whereas at top shows all of the above stamp. 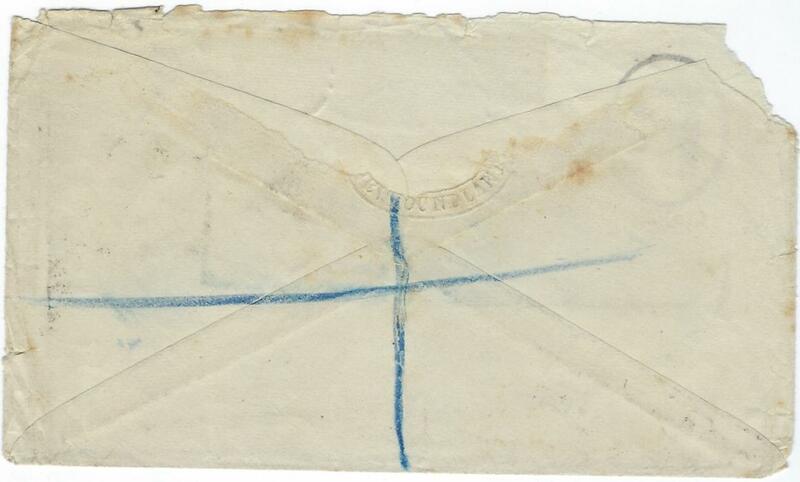 (Picture Advertising Stationery) 1890 1c. 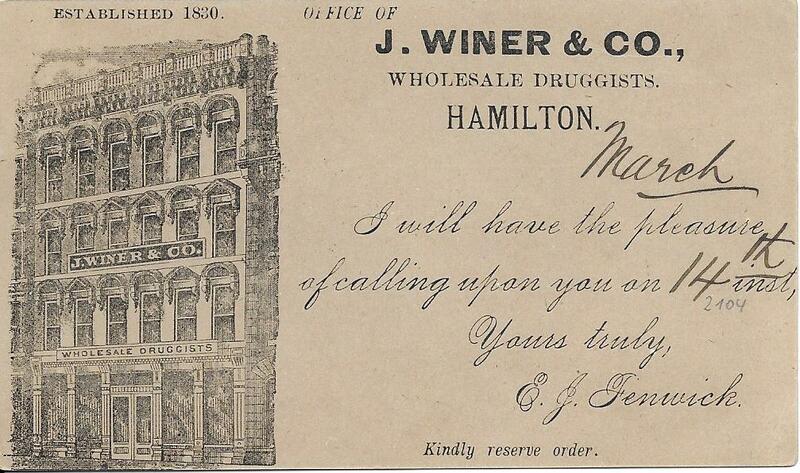 card for a �Wholesale Druggist�, good used from Hamilton to Galt, Ont. 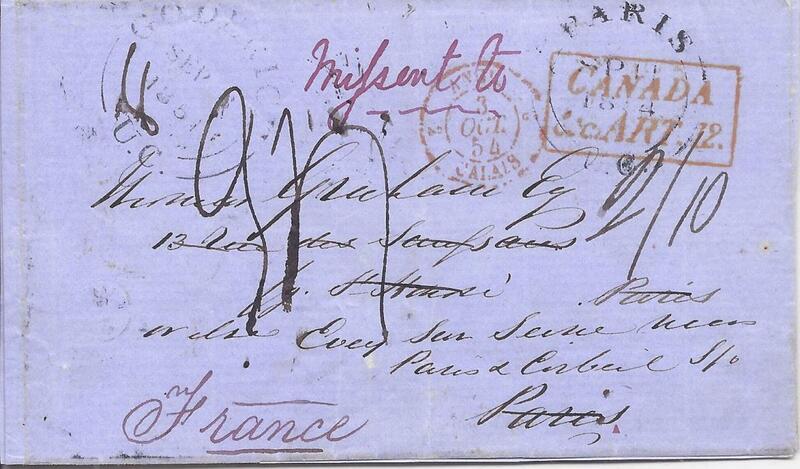 (Prince Edward Island) 1872 (March) cover from Charlottetown to London, franked at the 8c. 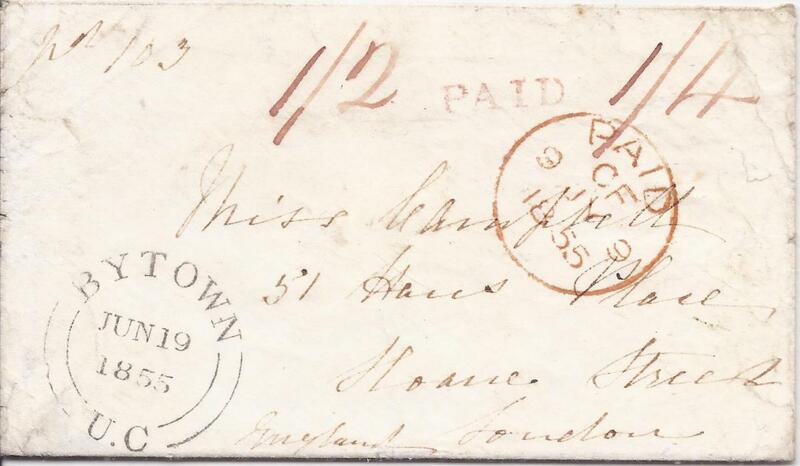 rate to pay for the faster 'Cunard' service via New York by 1872 1c. 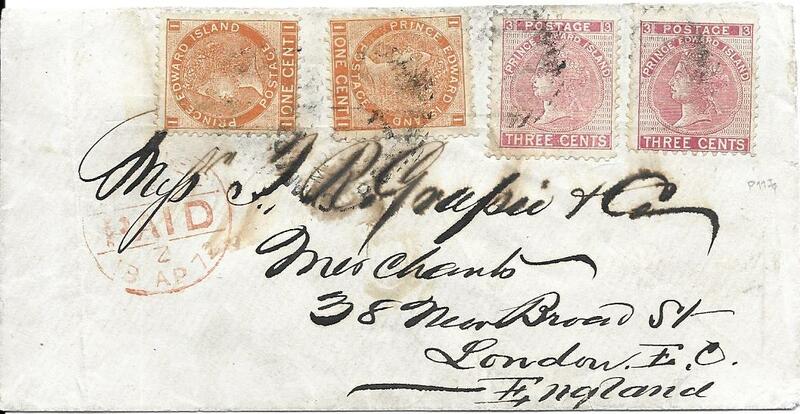 brown-orange (2) and 3c. 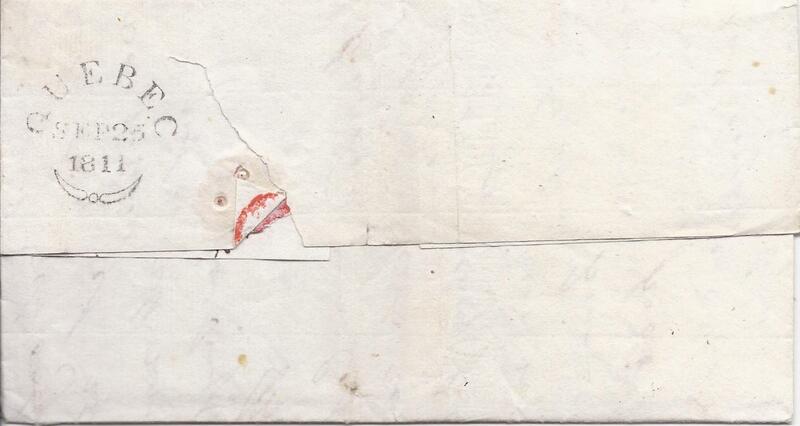 rose (2) tied by 'barred and dotted' obliterator, London arrival. 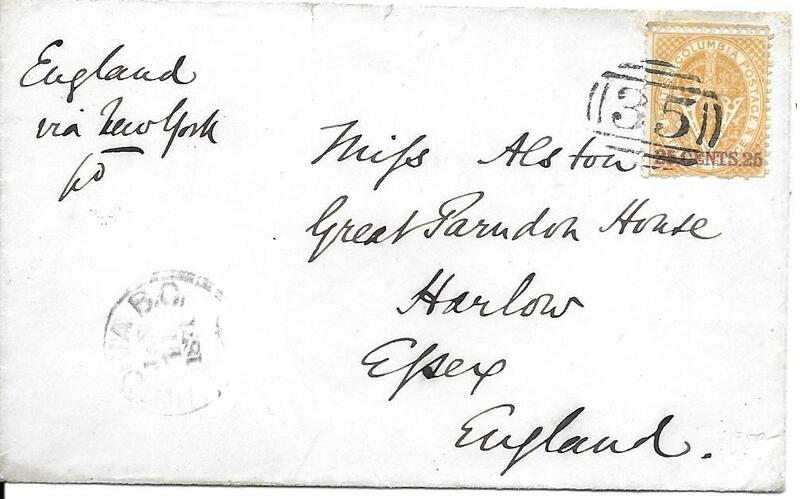 Slight faults including creasing but a unique and important cover. 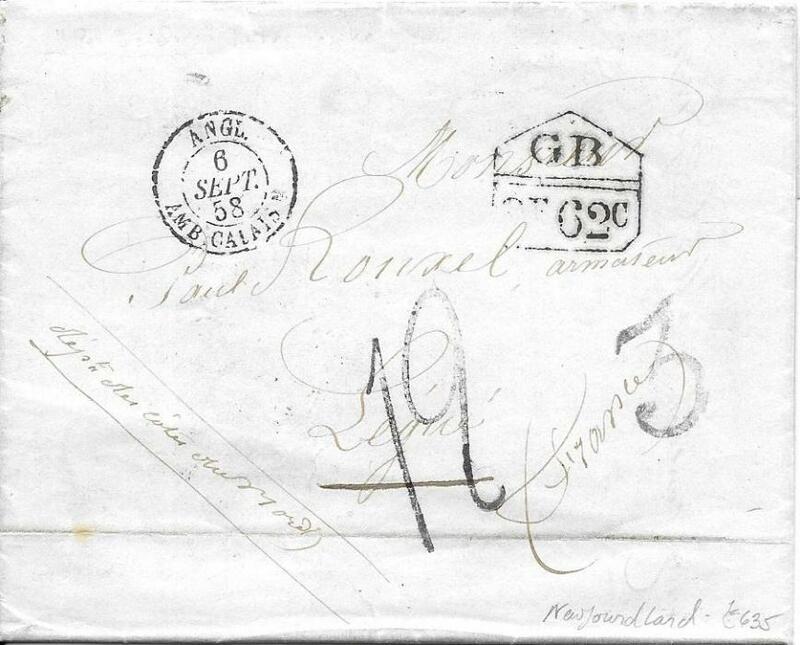 Any cover to the UK with the 1872 'cents' issueis very rare, but this is the only recorded example of the 8c. rate. 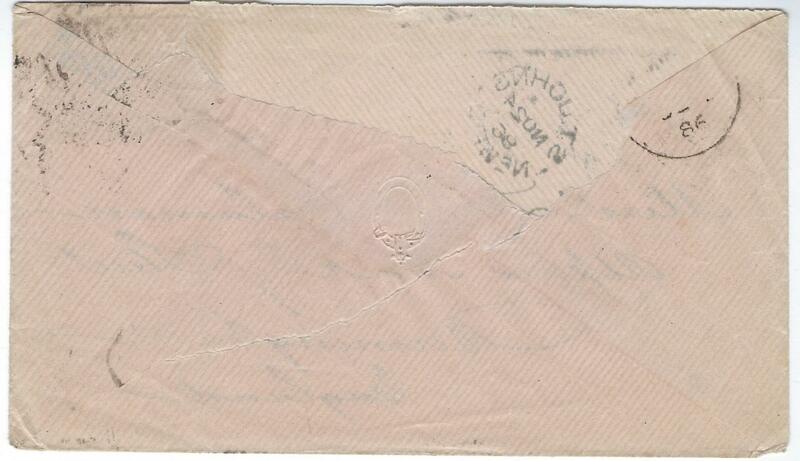 RPS Cert (1984), Ex Brassler. 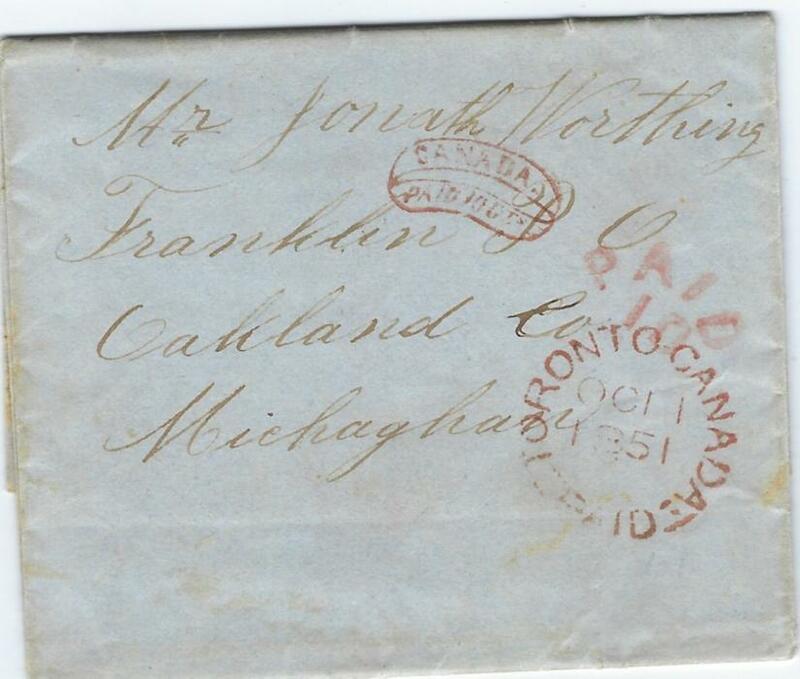 1851 (OCT 1) entire to Franklin, Oakland Co., Michighan bearing Toronto Canada Paid date stamp together with cursive framed CANADA/ PAID 10Cts as well as American PAID 10 cursive handstamp; good quality strikes on small neat entire. 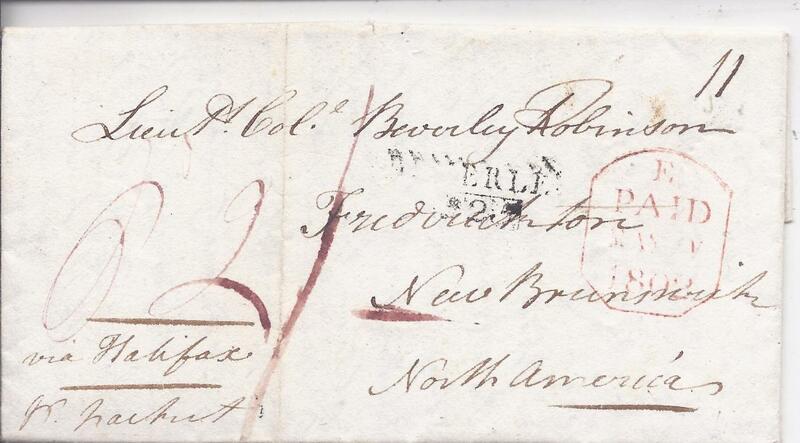 1855 cover to London bearing fine Bytown U.C. 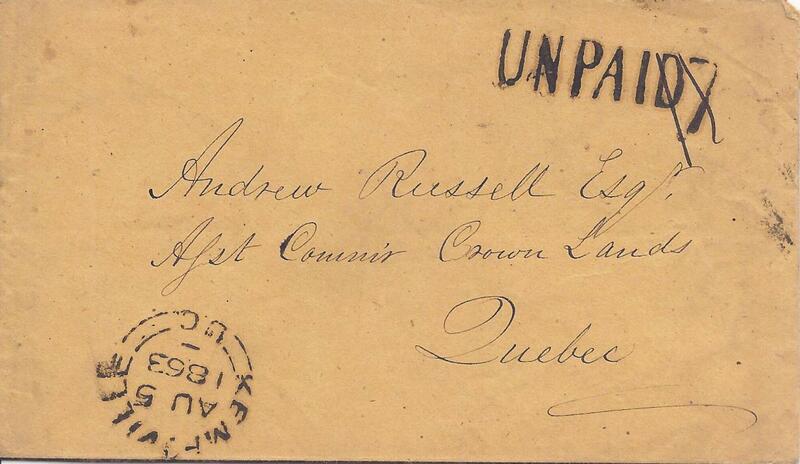 date stamp, red manuscript "1/2" (sterling) and "1/4" (currency) with hanstaruck PAID in between, reverse with Montreal transit cds, arrival on front. 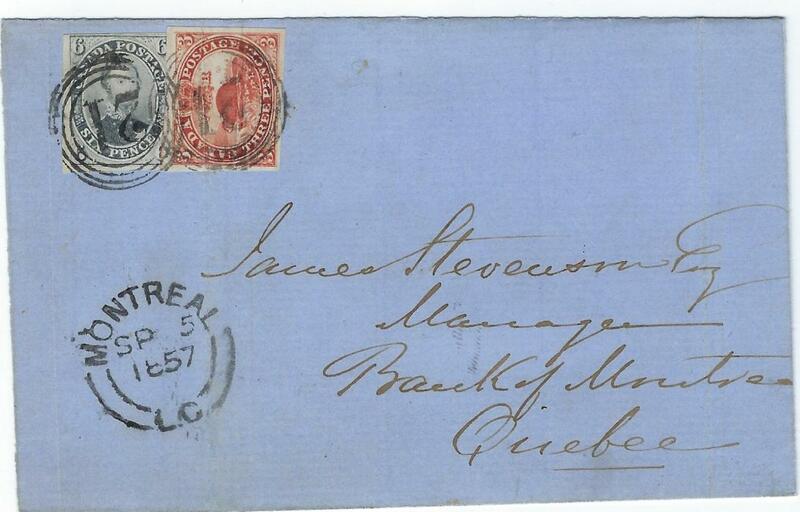 1857 outer letter sheet to Quebec franked by 1852-57 imperf 3d �Beaver� and 6d. 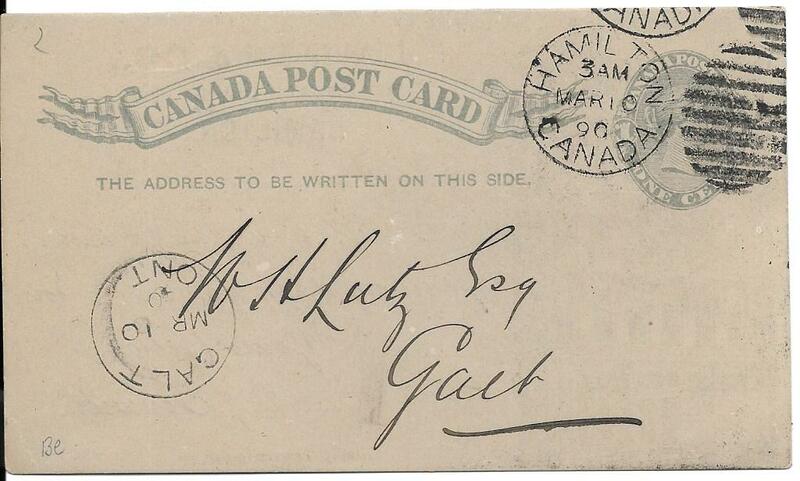 �Prince Albert� both cancelled by fine �21� numerals with Montreal cds in association below, arrival backstamp. 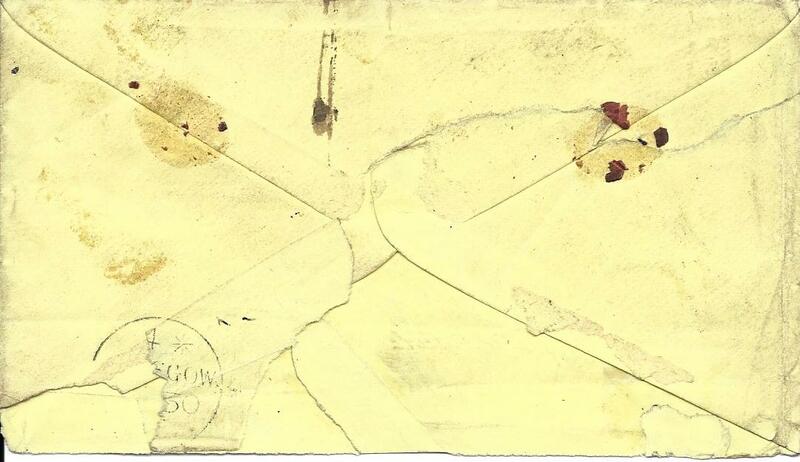 The 3d with four fine margins and the 6c. 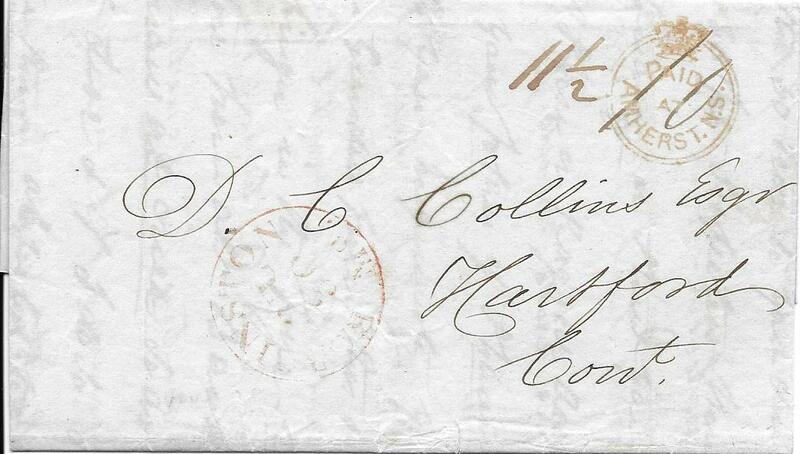 with two large margins, complete but close margin at top and the right side not visible but appears complete from reverse. 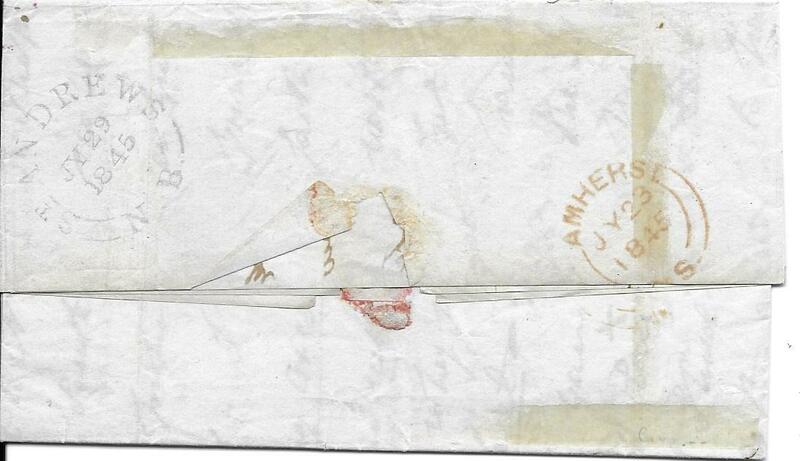 A very fine and attractive item. 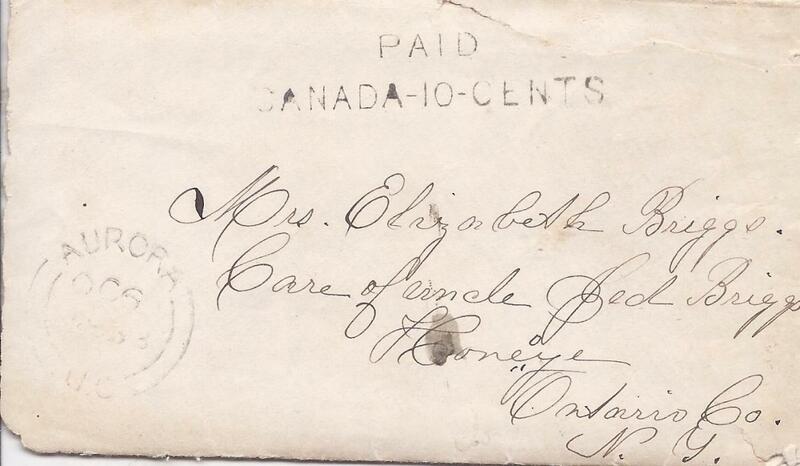 1863 cover and original letter to Honeye, Ontario Co., NY, USA, bearing Aurora cds and two-line PAID/ CANADA-10-CENTS handstamp, slight faults to envelope. 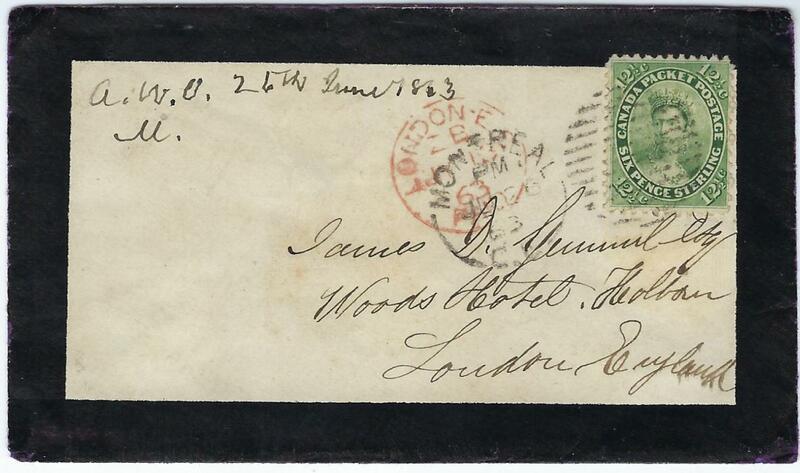 1863 mourning cover to London franked perforated 12�c. 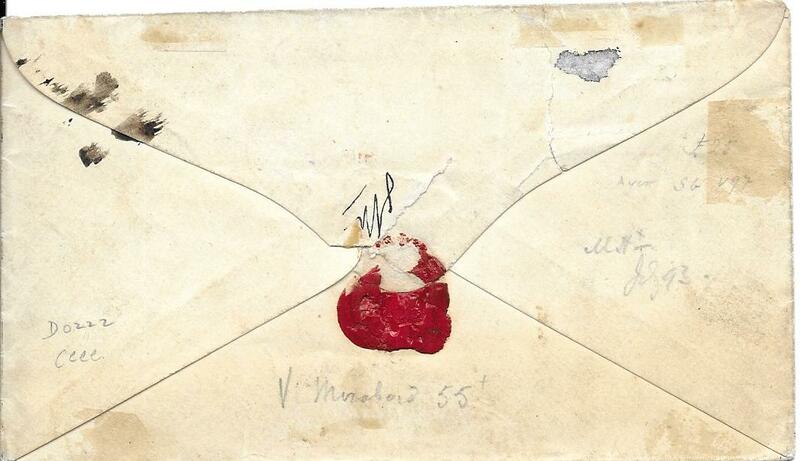 tied Montreal duplex partly overstruck by red London arrival; wax seal cut out from back, attractive appearance. 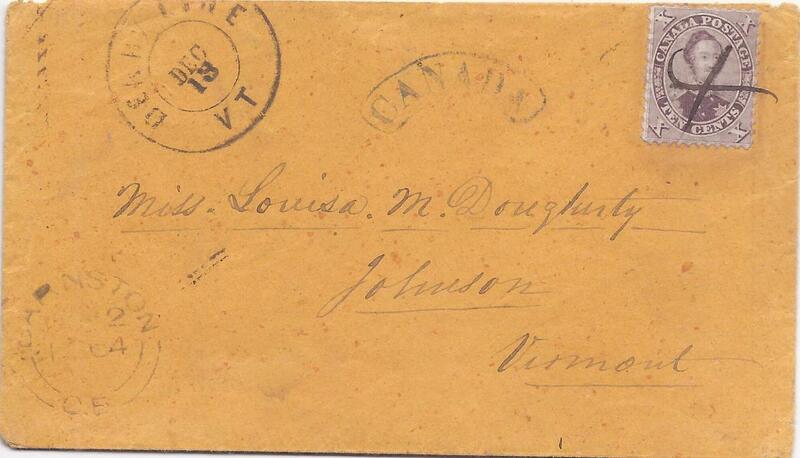 1864 cover to Johnson, Vermont, USA bearing single franking perf 10c. 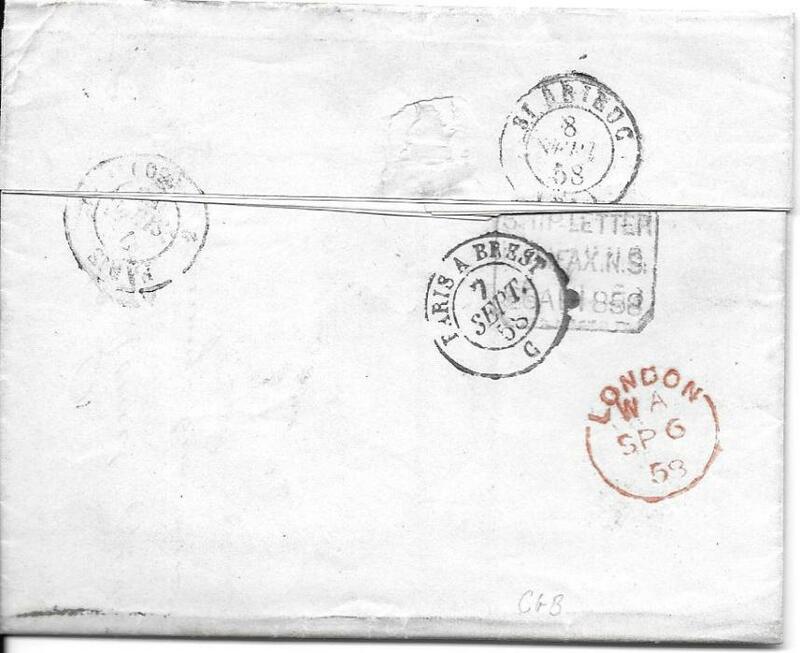 Prince Albert tied by pen cross, arced framed CANADA handstamp and despatch cds bottom left, arrival cds at top, attractive envelope. 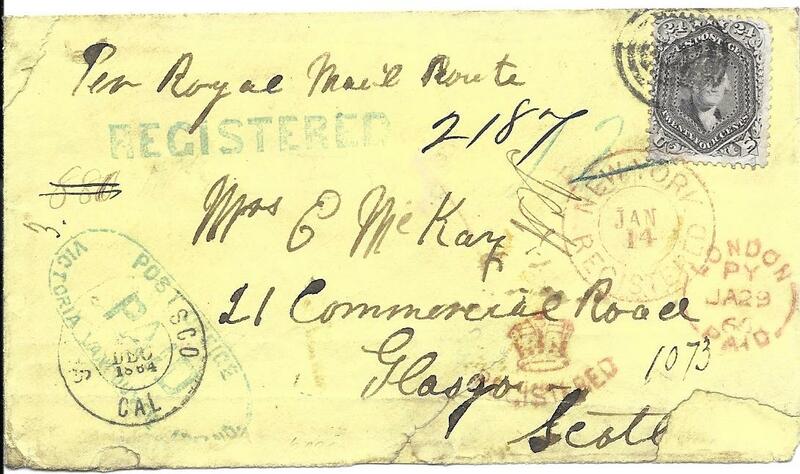 1864 registered cover to Glasgow, endorsed "Per Royal Mail Route" and bearing straight-line REGISTERED and framed POST OFFICE/ VICTORIA VANCOUVER handtsamp, franked United States 24c. 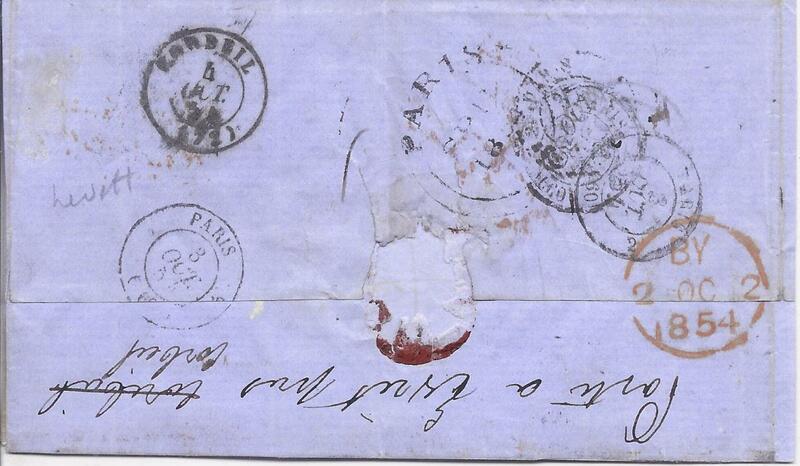 tied target handstamp and by New York Registered date stamp,San Francisco transit cds bottom left, cursive (crown) Registered and London Paid cds arrival backstamp; some faults to envelope but still an attractive example of rare registered mail. 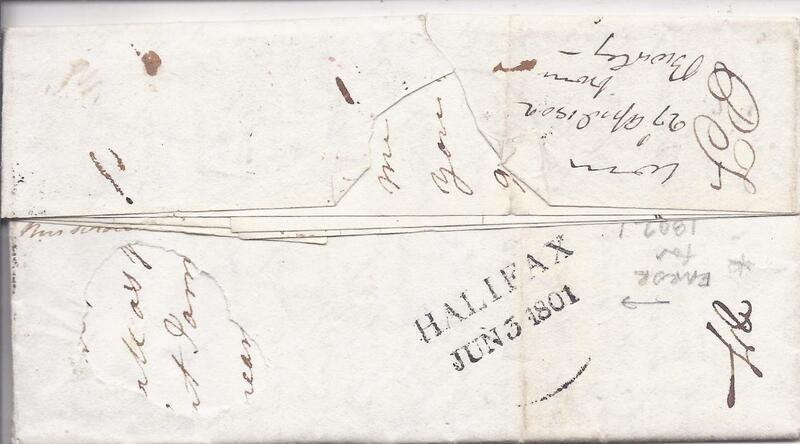 1867 cover to Maine USA bearing large privilege handstamp of House of Commons with pair 1859 5c Beavers, tied Ottawa duplex, Montreal Post Office backstamp; good fresh condition. 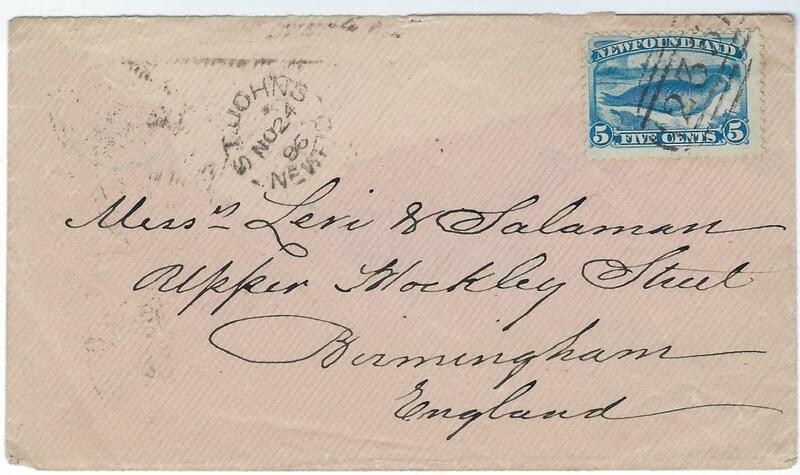 1886 cover to Birmingham bearing single franking 5c Common Seal tied by '235' obliterator with St Johns cds to left, part arrival backstamp affected by missing backflap, fine and fresh appearance. 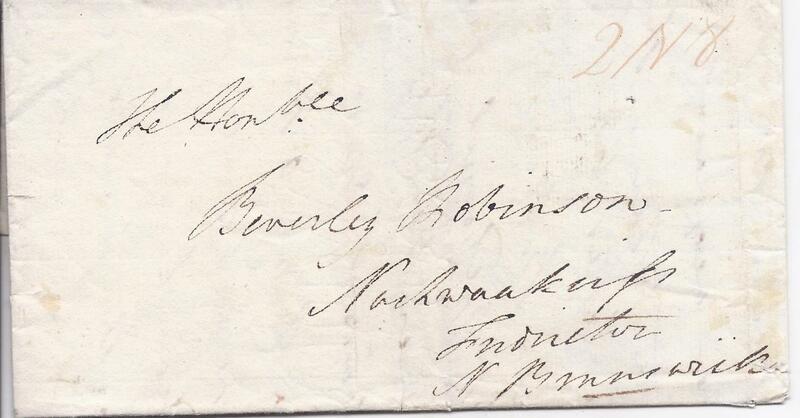 Incoming Mail 1811 part entire to "Beverley Robinson" New Brunswick bearing faint manuscript rate markings, reverse with fine Quebec fleuron.